Step 1: If you get WhatsApp popup then does not tap on the “Agree” button. Step 2: Tap on the read more button and uncheck the “Share my WhatsApp account information with Facebook“. 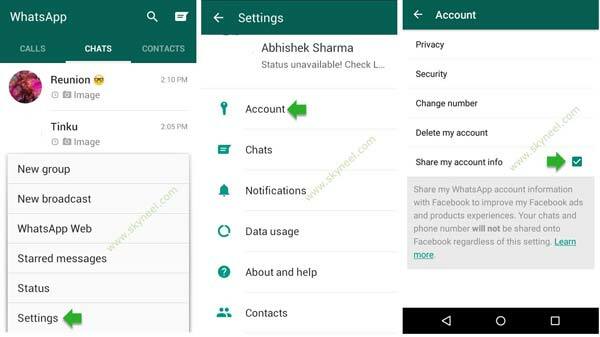 Now, after uncheck this option your WhatsApp data does not share with Facebook. If you accidentally tap or click on the “Agree” button on WhatsApp sharing popup policy then you have to take few given simple steps to stop WhatsApp from sharing your data with Facebook. Step 1: Tap on the WhatsApp icon to open your WhatsApp account on your phone. Tap on the “Settings” option and tap on the “Accounts” option. Step 2: Tap on the “Share my account info.” check box. If you want to disable this feature then tap on the “Don’t Share” button which prevent WhatsApp from sharing your data with Facebook. I hope after reading this article you will be able to easily stop WhatsApp from sharing your data with Facebook. After using these methods you can easily prevent WhatsApp data sharing with Facebook If you have any query regarding this article then give your suggestions regarding this article in the comment box. Thanks to all.